KHARKIV, Ukraine -- The mayor of Kharkiv in eastern Ukraine has been shot in the back and critically wounded amid continuing unrest in the region. Mr Kernes has been described as a "mini-oligarch". 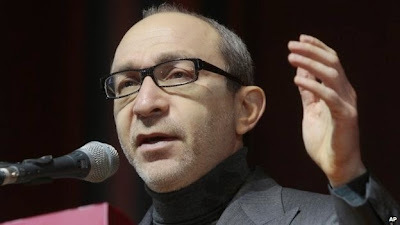 Hennadiy Kernes was recovering after a two-hour operation to repair damage to the chest and abdomen, but his life remained in danger, his office said. Monday also saw pro-Russian separatists seize a local government building in Kostyantynivka, a town to the south. The US has meanwhile expanded sanctions to include targets linked to President Vladimir Putin's "inner circle". The list includes seven new individuals and 17 companies. The European Union is also expected to announce new sanctions. Western nations accuse Moscow of supporting separatist gunmen who are occupying official buildings in cities across eastern Ukraine. The separatists continue to hold seven Western military observers who were seized last week in the region. Mr Kernes used to be a supporter of the former pro-Moscow President Viktor Yanukovych. He then dropped his support for the ousted president in favour of a united Ukraine. He has been described as a "mini-oligarch" - a successful businessman wealthy enough to launch a career in politics. He has been accused of starting his business career as an organised crime boss, a claim he denied while acknowledging that he was once jailed for fraud - a minor offence "partly fabricated" by his enemies, he insisted. Kharkiv was also the scene of clashes on Sunday when football fans marching for a united Ukraine scuffled with pro-Russia supporters. The authorities in Kharkiv said several people were injured. On Monday morning, gunmen wearing uniforms with no insignias moved into the local administrative building in Kostyantynivka and raised the flag of the self-proclaimed "Donetsk Republic". They were also reported to be in control of the police station in Kostyantynivka, which is located between the town of Sloviansk and the city of Donetsk, both also controlled by separatists. US President Barack Obama confirmed the stepping up of sanctions against Russia, which he said was part of a "calibrated effort" to change Moscow's behaviour in Ukraine, during a visit to the Philippines. He said the measures were in response to Moscow's failure to uphold an international accord aimed at peacefully resolving the Ukraine crisis. A White House statement said the new targets were "seven Russian government officials, including two members of President Putin's inner circle, who will be subject to an asset freeze and a US visa ban, and 17 companies linked to Putin's inner circle, which will be subject to an asset freeze". Mr Obama said the sanctions were not aimed at Russian President Vladimir Putin personally. "The goal is to change his calculus with respect to how the current actions that he's engaging in could have an adverse impact on the Russian economy over the long haul," he said. Meanwhile, ambassadors from the 28 EU member states are meeting in Brussels to agree new sanctions against Russia. The US and EU already have assets freezes and travel bans in place targeting a number of Russian individuals and firms accused of playing a part in the annexation of Crimea last month. BBC Europe correspondent Chris Morris says it is expected that the ambassadors will add another 15 people in positions of power to the list of those to whom sanctions apply. Our correspondent says the White House wants a show of unity from the US and Europe, but there is little consensus within the EU at the moment for implementing broader economic sanctions against Russia. Eight foreign observers - who were operating under the auspices of the Organization for Security and Co-operation in Europe (OSCE) - were led into Sloviansk town hall by masked gunmen and shown to the media on Sunday. German monitor Col Axel Schneider, who spoke for the group, stressed they were not NATO officers - contrary to claims made by the separatists - nor armed fighters, but diplomats in uniform. Later, one of the group - a Swede - was freed for medical reasons. The fate of five Ukrainian military officers accompanying the mission is unknown.